How can you stand out from the crowd in your executive job search? With the rise of social media, it has become much easier for recruiters to build relationships with senior executives who exhibit the experience and skills they’re looking for. It’s vital that you’re using social media in a way which gets you noticed. Social recruitment is here to stay. It makes sense that ‘Thought Leadership’ is taking the more personable form of ‘Social Leadership’. Paul Frampton explains that having an active social presence whereby you demonstrate your leadership qualities will get you noticed. And, with the multitude of social media platforms, it couldn’t be easier to illustrate your knowledge and leadership capability. If you’re new to Twitter, I recommend reading this article before delving into the rest of this post. Once you’ve followed these tips, you’ll be well on your way to establishing your personal brand; connecting with the key players in your executive job search; and tweeting quality content. But, by now you might have noticed some frustrating little problems with Twitter. Here, we’ll discuss two specific issues and how to overcome these. That’s ok! There are some great social media management tools out there that allow you to schedule messages in advance and even tools that help you to find great content to share so you can make a commitment to stay active and interact with your followers without spending hours of your day on social media. In fact, Ted Coiné revealed that despite being a Forbes Top 10 Social Media Power Influencer and co-author of A World Gone Social, he spends a tremendous amount of each day not on social media and he encourages others to do the same (here’s how Ted uses a combination of automated tweets and personal interaction to build his Twitter presence and develop relationships with others). The best way to achieve this is to use a tool such a Buffer or Hootsuite to schedule posts in advance. Each has their pros and cons but if you want a free account, I suggest you opt for Hootsuite as Buffer’s free account will limit the number of messages you can schedule at one time. You can also get a free add-on for your browser which allows you to schedule posts from any webpage. No doubt you read many articles that you could be sharing to establish yourself as an expert in your field. Perhaps you’re publishing such articles yourself. Remember that recruiters, headhunters and hiring managers will most likely find you through the content that you post – and they’ll be using search terms to discover industry experts. Whilst you’re scheduling content for Twitter, will you be doing the same for LinkedIn too? Of course, if all your tweets are automated it’ll be pretty obvious that you’re not on Twitter yourself. Make sure you frequently sign in to comment on and re-tweet others tweets and thank people for following you/sharing your content too. The more people you follow, the more difficult it becomes to sort through the chatter to find relevant content and engage with the people you want to develop relationships with. It might be tempting to simply stop following people but wait! When Twitter gets too noisy, you simply need to organise your Twitter feed. Thought leaders in your industry – this list is essential for keeping up to date with a dynamic industry and its changing trends. Add yourself to this public list so your tweets are seen too. Be aware of what members are sharing and engage with these people. Companies you’d like to work for and their existing employees – you’ll get a feel for the company culture and discover topics that are important to the company and the employees. You can get yourself noticed by engaging with individuals and sharing similar content. Once added, you can begin tracking individuals’ updates and engaging with their tweets. If they find you interesting, many will follow you (or add you to a list of their own). Executive recruiters are increasing their investment in social media, and so must you. Struggling to keep track of key people? Use Twitter lists. Don’t know what to share? Look for inspiration from others in your field. 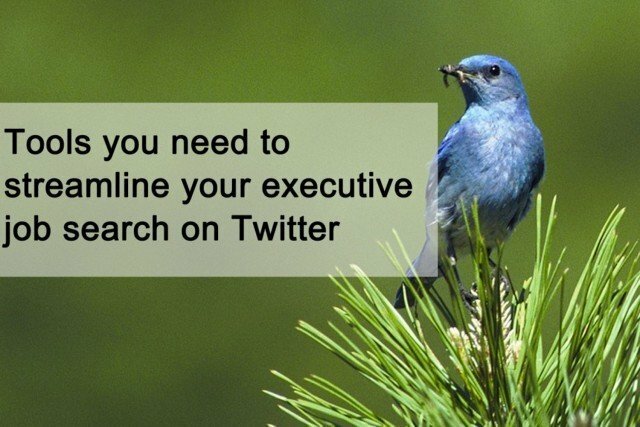 With scheduling tools and Twitter lists keeping you organised while you become an established social leader and tweet your way into a new senior executive role, you’ll soon be nailing it on Twitter too!